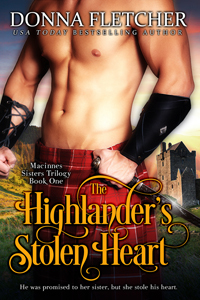 The Highlander's Stolen Heart now available! Unfortunately the print version has been delayed, though it should be ready sooner rather than later. Will let you know as soon as it’s available. I’m waiting for the Kobo version, any idea when it will be available? I don’t understand what’s taking so long for it to go live. I’ve never had this problem before with Kobo. I’m looking into it now. So sorry for the delay. Not a problem. I’ll just keep watching for it. Whatever you did, it worked! The book is available no. Yes, it is now available! I just connected the link! So happy! Loved the Highlander’s Stolen heart first book Can you tell me when the next book will come out. So far the second book in the Macinnes Sisters trilogy is slated for release in the fall, but don’t have an exact time yet. So happy you enjoyed The Highlander’s Stolen Heart. You made my day! Thanks so much for letting me know how much you enjoy my books. And not to worry, there are a lot more books on the way!